I know what you’re thinking when you’re watching Girls. You’re sitting in front of your laptop or television, eating a bowl of cereal and watching Hannah and Marnie argue. You watch Jessa ruin another man’s life and then you ask yourself: “Who was the Lena Dunham of the 1930s?” Common question. Well, we’re here to tell you: it was Barbara Stanwyck, if you’re going for the “hilarious young woman” thing. 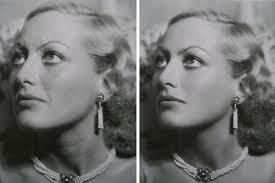 As for actresses who were heavily scrutinized, you can also add Joan Crawford to that list. 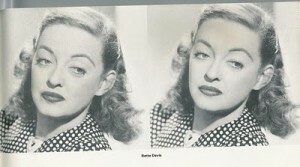 Or Bette Davis. And guess what? They were all retouched in photographs. 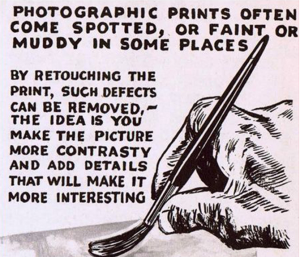 Photographic manipulation – including “airbrushing” and retouching – has been going on pretty much since photography itself has been around (think tinting of daguerreotypes back in the 1840s). In the 1940s, this manual outlined standard to basic retouching techniques. The main practice for retouching photos was to make things making things “more contrasty” (real words), otherwise known as contours. You know, those shadows and lines that make it look like we have things like cheekbones and cleavage. Photographers like George Hurrell worked to make the stars as flawless as possible, making some areas more contrasty (left) and some less (get rid of those wrinkles! Botox hasn’t been invented yet!). The famous Joan Crawford’s (left) before and after shots demonstrate the common retouching tricks of the era. Strange that, for an actress beloved for her expressive face, they have removed her furrow lines. These photos play into the idea of the actress as beauty queen, rather than, you know, a legitimate actor. There were definitely some craggy men about Hollywood at the time that nobody cared to fix (here’s looking at you, Humphrey Bogart). But, unlike now, the audiences were willing to buy into the concept of stars’ perfection. Stars were supposed to be just like you and me — only better. What we could have been if only genes and destiny had been slightly more contrasty. We still bought into the fantasy of perfect glamour, even if we knew it wasn’t always accurate. Kind of like Hugh Hefner. He’s got to know that 99% of the breasts he sees are not actually breasts, but he has decided to make his peace with that and move on. Bette Davis, meanwhile, was a contemporary of Crawford’s and known for her arch, intelligent performances. But even back in the 1930s, being seen as snobby and elitist could immediately label you “box office poison” (which happened to Greta Garbo, Marlene Dietrich, Katharine Hepburn, and others in the late 1930s). On that note, notice how the retouched photo (left) has taken away Davis’ subtle sneer? As well as her under-eye shadows. A woman must be soft and well-rested. “Vogue isn’t the place that we go to look at realistic women, Vogue is the place that we go to look at beautiful clothes and fancy places and escapism,” Dunham said, in reply to the controversy. Unfortunately, this may have been true back in the old days, but clearly isn’t the case anymore. Now, rather than living in a Hefner-like delirium, we’ve become obsessed with looking for these changes, circling them and pointing them out. We’re so fascinated now by the process (and so divided on its consequences) that perfect glamour seems dirtied and anti-feminist. But don’t think that just being skinny and young can save you from the photoshop treatment. In today’s magazines, stars cannot be too fat — but nor can they be too thin. In our book, I wrote to Jess and joked that one of my dreams was to be on the cover of Vogue, where they have to retouch the photograph to make me look fatter because I am too skinny. It was a joke, but it has actually happened to Cameron Diaz. I deal with this problem by never ever being photographed. No one can call your dress unflattering, your skin saggy or your face wrinkled if they have no proof. (Although friends and family WILL call you a lot of other names if you keep ducking out of their photos at the last moment. Double-edged sword.) The dream of Hollywood glamour grows fainter every day, as portraits become less icons of aspiration and admiration and more “Where’s Waldo” as we try to spot where the perfection has been manufactured.